There is a new updated Epic Solitaire Notebook Adventures up and available. New features include dungeons, which is completely inspired by someone who tested the game named Cameron Harris (I think), but who I've lost his email. Dungeons, while right now I don't think happen regularly enough, solve a little sticking point I've had; namely, that of "why don't you just funnel all of your development points into a single Settlement, instead of spreading them out?" Hopefully, the appearance of a dungeon in a kingdom where a player is simply "camping out" for level ups will make him think twice. Dungeons are simply a series of battles, that pay out 2X gold, and when they exist, prevent special effects of Settlements from happening. Plus, if you decide to NOT try and take out the dungeon, the Settlements get angry with you. To offset the new dangers of Dungeons, I've added a new "harder to die" feature, which allows for a scavenger magician to find your body, and replace your severed limbs with magical armor. Fun stuff, if you look through the abstractness of it all. I'm at the point now with the game that I don't mind it being posted up to the geek, so if anyone wants to earn some geekgold, feel free to submit the game. On another note, in honor of my love for games that play differently, I picked up the new Z-Man edition of Tales of the Arabian Nights. And then, I put it down, and picked it up again. It's a good workout, given that the box is amazingly heavy considering that it's all cardboard and paper (no wood pieces). After playing around with it a little bit solo just to get the feel of how it worked, I came to the conclusion that it really does feel like a game produced in the early 80s: fairly simple mechanics wedded to countless look-up charts that reference other look-up charts. But it's a 1980's game with the trappings of the new millenium's penchant for gorgeous art and top notch production values. Even the box top oozes class; the main background of the box is matte black, but the rest of the artwork is all colorful and glossy. Granted, I don't buy too many games, but I don't think I've bought a game with cardboard punch-out chits this thick before. Anyway, I look forward to bringing this handsome edition of a "choose your adventure" book out on the table soon, even if it's just with my 6 year old daughter, who should be able to handle most of it easily as long as I'm the reader, since the game is pretty much A) move in the world, then B) go through a look-up chart process to find out what story happens there. Also, I wouldn't running a play-by-forum/blog version Tales at some point. Granted, it's a lot of typing, but the game flow and 99% non-turn-order wackiness should make it easy enough. Speaking of play-by-forum, I'm currently in Season 12 of the Battlestar Galactica play-by-forum game at the 'geek. Needless to say, with all of the possible interrupting, and potential out-of-turn card play, it's a slow go. Very slow. I'm amazed that people can actually RUN a play-by-forum version of this game, much less play it. For the record, the game officially started over a month ago, and we still haven't quite made it 'around the table' of player's turns yet. **Still awaiting his next chance to playtest the Three Fates game. At the BGDW meetings recently, I’ve been running into a various games that have been toying around with different ways of dealing with player order. I figure it’s an interesting subset of mechanics to explore for a little bit. Out of ten chariots, you will most likely find that only 2 are still in the race by the first turn, and one of those have one of his wheels still on his chariot mostly by the power of wishful thinking. The other eight players will be either getting dragged by their horses, or running for the walls desperately trying to climb out of the arena. Really, there was very little reason to run three laps, aside from the glory of trying to run over players who are making hapless escape rolls. Anyway, turn order in that game is resolved simply enough; everyone puts their color chit into a cup, players determine their current speed, and then a color is drawn and that player takes his turn. The next color is drawn for the net player, etc. Since a player’s turn is taken immediately as colors are drawn, you don’t have any knowledge of the complete turn order for the round, it leaves a bit of risk and reward for where you want to wind up on the board, who you are trying to block, and how you want to waste your speed on combat. This didn’t seem that special at the time, as it felt like a good representation of the chaos of horse-ramming. And while I’m sure it’s not the first game to mess around with the standard “play moves to the player on the left,” it obviously didn’t scream “HEY LOOK AT THIS NEAT-O NEW MECHANIC” either. The first game that I can think of that I ran into a player order featured that DID seem to call out “HEY LOOK AT ME” was Manhattan. The players “edge” (as we called it, a holdover from playing Jyhad: The Eternal Struggle), would move to the next player at the end of a round, and the edge would signify who would go first the next. Over the course of four rounds, each player would go first, second, third, and last; thereby negating somewhat the first-player advantage (or in some cases, last-player advantage) that games typically have. Granted, nowadays, this is pretty much old hat; but back in 1994 or whereabouts, this was pretty slick and novel. At least to those of us who have never encountered such a thing before. But now, the these things seem to be a staple, with either auctions or “the edge” being the standard way to handle things. And as usual, things continue to evolve. I’m sure that other games that are currently out there do various tricks and things that I am not aware of; I can only speak of things that I have played. The trickiest part of handling wacky turn orders is trying to come up with a tabletop interface that helps keep track of the order. “Next player to the left” is pretty straightforward, but when the turn order can be all over the place, things can get a bit hairy. On the simplest front, one designer of our little group has a game where players take turns collecting various things. At any point, you can get out of the dwindling collection phase; the order in which you leave determines the turn order for the next round. When a player quits the collection phase, his pawn is placed on a turn order track, along with a matching color marker, in the first open space. Not only does the pawn “over there” signify that he is out of the collecting, the matching color marker stays there, indicating future turn order for the next round when the pawn goes off shopping. Next up on the complication scale would be a design of mine, which I’ll probably post up as a print and play when I get another play test under its belt. It’s an asymmetrical game, in that players select roles, with each role on a given round has different, and opposing, scoring opportunities. The turn order for selecting roles is determined through a bidding system. However, the bidding is a little different than the standard auction rules, in an attempt to make the bidding feel more organic, and less structured. Everyone first blind bids an amount, which is revealed. Then the player with the lowest bid can then pass, or select any higher bid than his current one, that is not currently selected by another player. Note that this is ANY bid amount, he does not need to be the highest one, but he can “slide under” the high bid and happily be the second highest bidder (for example). Then the play proceeds to the newly-appointed lowest bidder. To further complicate things, role selection is performed in reverse order of how players have passed. In other words, the first player to pass becomes the last player to select their role, and the last player still in gets first selection. Additionally, there’s a bit of a dollar auction going on here, in that the top TWO bidders must pay their bids. 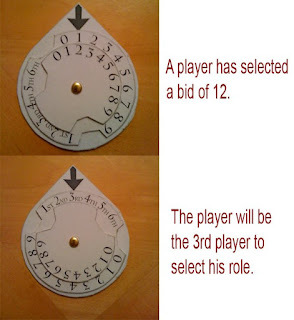 Since players aren’t taking turns bidding, simply beating the current high bid, as is usual, the chore was to come up with a clean way to keep track of each player’s bid, and the turn order in which they will select their roles. Initially, we played based on strict memory of each player; which works, but a more concrete way of defining these events would be nice. An obvious choice would be something like poker chips for the bid, and turn order markers. Which is a lot of things to be shuffling around the table. And so, the creation of a modified “secret bid” bidding wheel, which can be used for secret bidding, with additional marks on a second wheel for turn order indication was born. As can be seen in the pictures to the left here. Notches in the wheels allow for easy thumb-turning access for quick adjustments as bids are made, and as players drop out, they can simply adjust the wheels to their up coming role selection order. The third turn order complication really is a pickle. In this game, players secretly bid to take different actions, which have a specific turn order to them. There is a “tie breaker” list, which is an ordered column of tokens related to player colors. This is important because only one player can use a given action per round. Taking an early action is usually very powerful, however, if you are in the back in the tie breaking list, odds are that someone else will take the early action (who is higher up in the tie breaking list), leaving you to do nothing. However, as the actions are being taken, the player who takes the first action winds up moving to the rear of the tie breaking list for the next round. The player who selects the second action winds up being in the second-to-last position for the next rounds, etc. Players who are “beaten out” of an action and do nothing get to slide up in the list for the next round. So, usually taking a powerful early action on one turn usually means you are out of luck for doing anything useful in the next. Anyway, the way to track the moving the tie-breaking list is rather complex. Basically, the order in which you take an action this turn, puts you in the reverse order for the next turn, with players who take NO action in the front of the list for the next round. What I came up with to solve this problem is this: a stand up model, with rolling chips. The right side of the model indicates the current tie-breaking list, with the far right chip being the first tie-breaker leader. As a player takes his action, he pulls his chip and places it on the left side. The chips roll down on the platform to the far left, in this case the cyan player. After a full round is played, the left platform is rotated up, and all the chips roll back into their place on the right side platform, creating a new tie-breaker list. And there you have it! A kind-of-neat mechanical device that cleanly deals with the complexity of the turn ordering system in a fun way. I think. Of course, I'm not saying that any of these solutions are cost effective from a publishing point-of-view. Especially considering that the last two games pretty much revolve around card play mechanics. But at least their solutions fix a problem; something that the silly cardboard cauldrons in Poison don't do.